Ron Wolf (born December 30, 1938) is the former American football general manager (GM) of the NFL’s Green Bay Packers. He also played a significant role in personnel operations with the Oakland and Los Angeles Raiders from 1963–1975 and again from 1978–1990. He joined Green Bay’s front office in November 1991 from a personnel director’s job with the New York Jets. With the Raiders, Wolf took part in drafting such notable players as Art Shell, Gene Upshaw, Ken Stabler, and Jack Tatum, all of whom would play for the Super Bowl XI Championship team in 1976, and later such players as Howie Long, Marcus Allen, and Matt Millen, all of the Super Bowl XVIII Championship team in 1983, the then Los Angeles Raiders. After the death of Raiders owner Al Davis, Wolf was rumored to possibly come back to Oakland. He didn’t specify that he wanted to have a full time job as General Manager there, but he told the new ownership team that he would assist them with anything they needed. In an interview with the Milwaukee Sentinel he supported Green Bay Packers director of football operations, Reggie McKenzie as a perfect candidate for the GM position in Oakland and called him a “tremendous evaluator” when it comes to finding players. In 1975, Wolf joined the expansion Tampa Bay Buccaneers as vice-president of operations. He helped build the team that would advance to the 1979 NFC Championship game. He would not be around to see his team develop, however, as he resigned his position with the Buccaneers in February, 1978, citing “personal matters”. It is believed that he had difficulty working with Buccaneer owner Hugh Culverhouse, and that Culverhouse was trying to interfere with personnel decisions. Wolf later indicated that Culverhouse’s close personal relationship with and strong financial stake in coach John McKay meant that Wolf had to be the one to pay with his job for the team’s 0-26 start. Wolf returned to the Raiders on the expiration of his Buccaneer contract. In 1991, Wolf was hired to replace Packers General Manager Tom Braatz. Wolf’s first major decisions were to fire head coach Lindy Infante, hire then-San Francisco 49ers offensive coordinator Mike Holmgren to replace him, and to trade for then-Atlanta Falcons backup quarterback Brett Favre. In 1993, Wolf signed the most sought after free-agent available, Reggie White, bringing in a team leader and defensive superstar. This signing, in NFL free agency’s first year, also made Green Bay a more desirable destination for future potential free agents, including White’s fellow defensive linemen Santana Dotson and Sean Jones. Specifically, White’s arrival negated the perception of Green Bay as a city where African-American players did not feel welcome. With White and cast-off Gilbert Brown, Dotson and Jones formed the heart of the Packer defense during the team’s championship run. Over his nine-year term as GM, the Packers compiled a 92–52 record, good for a .639 winning percentage, second in the NFL over that span to the San Francisco 49ers. The Packers won Super Bowl XXXI against the New England Patriots, lost in Super Bowl XXXII to the Denver Broncos, and made the playoffs six straight times. 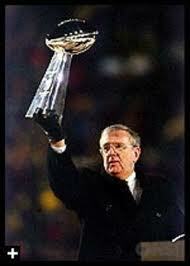 Wolf announced he would retire as Packers GM in February 2001. He stayed on through the April NFL draft and officially retired as Packers GM in June 2001. 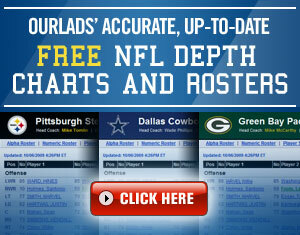 Afterward the Packers head coach at that time, Mike Sherman, assumed his duties as GM. This entry was posted in Ourlads' Scouts Hall of Fame and tagged Dan Shonka, Green Bay Packers, NY Jets, Oakland Raiders, Ourlads NFL Scouting Services, Ron Wolf, Tampa Bay Buccaneers. Bookmark the permalink.